Manchester United are reportedly weighing up an approach to sign David Brooke from Premier League side Bournemouth in the summer. The 21-year-old only joined the Cherries from Sheffield United at the start of the season but he has been a revelation with six goals and four assists in 22 league appearances. According to The Manchester Evening News, his bright form has caught the eye of the Red Devils, who are considering a potential move for his services when the campaign concludes. Brook has regularly featured for the Cherries on the right side of the attack and this is a position which the Mancunian giants are seeking to strengthen for next term. Anthony Martial, Marcus Rashford and Jesse Lingard have all found success from the position but none of them have managed to provide consistent performances from that side of the field. 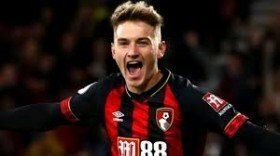 The Welsh footballer contributed a goal and an assist for Eddie Howe's side during their shock 4-0 win over Chelsea in the Premier League on Wednesday night.